Work on the 35-story Vietcombank Tower office building in downtown HCMC will begin in the middle of this year, five years after receiving its investment license, the developer said late last week. Ngo The Khai, general director of Vietcombank-Bonday-Benthanh Joint Venture, told the Daily at the signing ceremony for the test pile and substructure package agreement that the ground-breaking ceremony could take place in June. The office building will be seated on nearly 3,230 square meters facing Me Linh Square and Ton Duc Thang, Hai Ba Trung, Mac Thi Buoi and Phan Van Dat streets in District 1. With a total floor space of 77,000 square meters, the tower is expected to come into service in June of 2013. It will become Vietcombank HCMC Branch Headquarters (some 40% of its area) and a Grade A high-rise office building with 35 floors and a four-level basement. The investment is estimated at US$96.5 million, almost US$41.5 million higher than originally planned in April of 2005. The venture licensed by the Ministry of Planning and Investment in 2005 has registered capital of US$55 million, with 52% of it held by Vietcombank, 30% by Bonday and the rest by BenThanh. The architecture is designed by Pelli Clarke Pelli Architects Inc., structure design by Meinhardt Thailand and M&E design by EEC Lincolne Scott and local architect A.T.A, according to the joint venture. “The building is expected and hoped to present itself as a warm home for all dedicated staffs of Vietcombank, an important cornerstone for the continuous development of Vietcombank in general and of Vietcombank HCMC in particular,” said Nguyen Phuoc Thanh, chairman of Vietcombank-Bonday-Ben Thanh Joint Venture Co. The project is in the critical stage of pile tests and substructure construction. Bachy Soletanche Vietnam, a subsidiary of Soletanche Bachy (France), a world leading foundation contractor, is the contractor for this package, which is to be completed after 17 months. Soletanche Bachy with its presence in over 60 countries has executed foundations for world record projects such as Petronas Twin Towers in Kuala Lumpur and Mega Tower in Hong Kong. The company has been in Vietnam since 1993 and has undertaken construction for nearly 50 projects throughout Vietnam including the Vietcombank building in Hanoi. Earlier, BenThanh Tourist planned to team with Germany’s Windhorst to build a 55-story tower at the site but the plan was abandoned due to financial difficulties. Pelli Clarke Pelli Architects has been selected to design the Ho Chi Minh City headquarters of Vietcombank. The client is Vietcombank-Bonday-Benthanh Joint Venture Company Limited. Vietcombank, also known as the Bank for Foreign Trade of Vietnam, is the flagship bank of Vietnam. The new tower will herald Vietcombank’s major presence in the country’s fastest growing city and largest commercial center. In addition to the branch headquarters, the 35-story Grade A building will contain multi-tenant offices, ancillary facilities, retail, restaurants, and parking. The project will be the first in Vietnam for Pelli Clarke Pelli Architects. The new tower will face Me Linh Square, one of downtown Ho Chi Minh City’s prime locations. Located on the west bank of the Saigon River, the Square is a focal point of the city’s Beaux-Arts plan, marking the convergence of several important thoroughfares. Vietcombank Tower will be the tallest building on the square, visible on all sides from across the city. At street level, the new tower will welcome the public with a generous retail component, including a branch of Vietcombank. The new bank will be designed in the tradition of great urban banks around the world — as a civic space that celebrates its country’s growing economic status. The tower will use elegant forms and timeless materials to express the bank’s and the nation’s aspirations. As a symbol of the growth and development of both Ho Chi Minh City and Vietcombank, the project is of great importance to both Vietcombank and the Joint Venture. The client intends the building to be responsive to its surroundings and a spectacular presence in Ho Chi Minh City. Construction is tentatively scheduled to begin in 2010 and end in 2012. The preliminary construction cost is estimated at $67 million. Vietcombank-Bonday-Benthanh Joint Venture Company Limited was formed by Vietcombank, the flagship bank of Vietnam; Bonday Investments Limited, a Hong Kong-based real estate company; and Benthanh Tourist Service Company, a leading tourism and travel services business. Founded in 1977 by Cesar Pelli and Fred Clarke, Pelli Clarke Pelli Architects has designed some of the world’s most recognizable buildings, including the World Financial Center in New York, the Petronas Towers in Kuala Lumpur, and the International Finance Centre in Hong Kong. The firm’s broad portfolio includes academic buildings, libraries, performing art centers, museums, research centers, residences, and master plans. The work of Pelli Clarke Pelli Architects reflects the belief that a firm must not be constrained by a signature style, but that great design arises from collaboration with clients and a respect for each project’s environmental, economic, and social contexts. The firm has been honored with critical acclaim and hundreds of design awards. The firm has designed headquarters for financial institutions around the world including Citigroup (London), BankBoston (Buenos Aires), Wachovia (Winston-Salem, N.C.), Bank of America (Charlotte, N.C.), Lehman Brothers (London), and Wells Fargo (Minneapolis, Minn.). 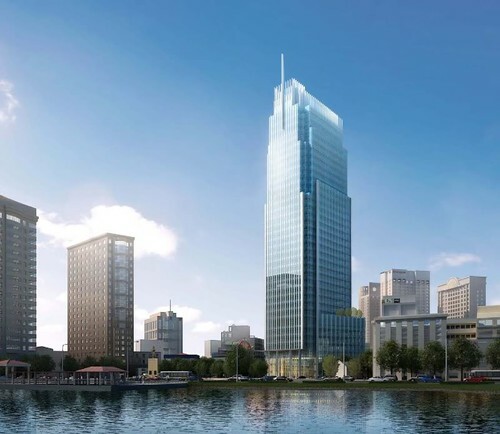 A joint venture between the Netherlands’ DHV Building&Industry, BV Architectenbureau Cepezed and Vietnam National Construction Consultants (VNCC) has won a contract to design and construct the new Vietcombank Tower, which will be one of the highest buildings in the country when it goes up in the HCM City’s District 1. Under the contract signed with Vietcombank Tower Project investors last Friday, the joint venture will undertake full design consultancy within six months, weighing in on the architectural, structural engineering, mechanical and electrical engineering aspects of the project. Vietcombank Tower will be a 35-storey office building with about 77,000sq.m of floor space at 5 Me Linh Square, overlooking the Sai Gon River. Investment for the project amounts to US$55mil. Construction is scheduled to begin later this year and last just over three years, according to figures from the management board of the Vietcombank-Bonday – Ben Thanh JV Co, the building’s investor. 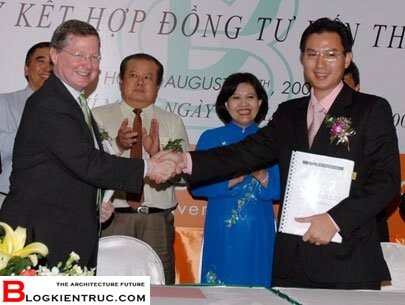 The Bank for Foreign Trade of Vietnam (Vietcombank) has a 52% stake in the joint venture, with Hong Kong’s Bonday Investments holding 30% and the rest held by HCM City-based Ben Thanh Corp.
“Located in the centre of HCM City and equipped with modern facilities, the tower project aims to meet the rising demand for office space, business and convention centres,” said Nguyen Phuoc Thanh, Vietcombank deputy general director and chairman of the Vietcombank-Bonday-Ben Thanh JV’s management board. DHV managing director and chairman of the DHV-Cepezed-VNCC’s management board Ad van Hamburg said that prior to embarking on the Vietcombank Tower project, the company was involved in wastewater treatment projects in Vietnam as well as the upgrade of Da Nang Airport.